Heart burn is one of the most common symptoms seen in about 5% of the Indian population. It is characterized by a BURNING SENSATION IN THE CHEST AFTER MEALS. It may be accompanied by sour eructations or food coming back into the mouth. Sometimes the distress is so severe that this condition is mistaken for a heart attack. 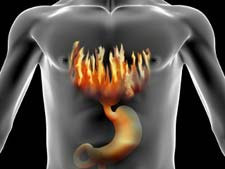 Heart burn is caused by reflux of the food and acid from the stomach to the food pipe. The root cause is inappropriate relaxation of the valve between the food pipe and the stomach. Ulcers in the food pipe. Bleeding from ulcers of the food pipe. Berrett's Esophigus which can lead to cancer of the food pipe. Increased cough in asthmatic patients. A comprehensive diagnosis is the first step towards the right treatment. The complications because of reflux of acid can be easily diagnosed by a simple test known as ENDOSCOPY In this process a small 9mm wide camera mounted over a tube goes into the food pipe and the stomach, which makes the whole area visible on a T.V. Monitor. Consume less water with meals. Do not sleep / lie down / bend / stoop immediately after taking meals. Go for a walk. Avoid citrus fruits, excess of tea and coffee.